Ok, I'm going to give you my first scooping review in two versions. Short version: This is excellent! If you are even remotely interested in this one, I say go for it. Crazy version: if I had to imagine what a nice key lime (pie) cheesecake tastes like, this would be it. I'm not saying it's cheesy per say, but there is that flavorful cream factor that a nice cheesecake has and I get that vibe here. There's a clarity yet control to the key lime flavor. It's mild but since this one is a well crafted gelato, the flavor cleanly strikes you in a way that you get the key lime experience without being overwhelmed. Even the aftertaste is controlled (and invites you to keep going). B&J's made a nice version a few years back, but their tart swirl was a bit unpredictable. Here it's smooth sailing in every bite. So there appears to be a bit of graham swirl about as well as plenty of crunchy cookie bits. See, I'm calling them cookie bits for now because they are indeed pleasantly crunchy and kind of remind me of my long last Nabisco oatmeal cookies. Ok, that's what I have for a quick first scooping that I did from the grocery store parking lot. I just meant to take a few bites but man was I compelled to just keep going (don't worry, I'll have some more in an hour or two). On Second Scoop: Ahhh, such a delightful treat. 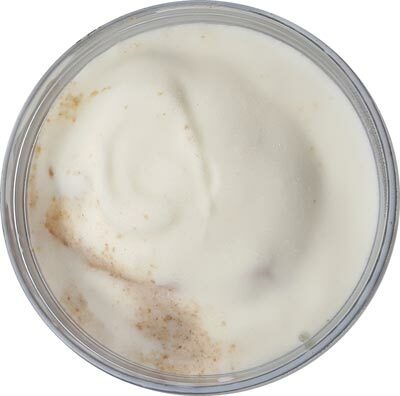 The mild key lime flavoring in such a sweet, soft base is just a joy to eat. It would be so easy to eat this pint in one sitting, let alone two, but I'm trying to be practical here. There is plenty of flavor in a small scoop that melts on your taste buds even if I really just want a monster scoop on my spoon. 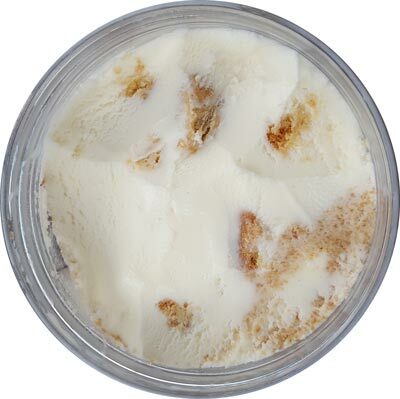 The graham swirl seems to be limited to the sides of the pint and the crunchy bits are now just solid bits after softening up a bit in a regular freezer. I really am enjoying the base, though as always, I wouldn't argue if there was a bit more swirl. On Final Scoop: Do you know why I call this blog On Second Scoop? It's because sometimes you need to sleep on how you feel about something. Sometimes you need to give it a week. I admit it, I was a little shocked to read the comments about how people aren't enjoying this one. Hey, to each his own, I'm not faulting anyone here, but please, if you don't like something, throw it in the back of the freezer and see how you feel about it in a week or two. Take smaller bites. Take bigger bites. Just try it again, no need to rush it. Remember how I said the cookies were a little solid on that first sampling? Look at them now! They're just breaking apart and spreading their tastiness everywhere. That is a #funfactor and it's just one reason why I'll be picking this one up again. I just got this and I don't like it at all. It tastes like fake lime flavor, like a lemon-lime soda and is way too sweet. There is next to no tartness. Guess I should add the disclaimer that I'm not a big fan of tart, I'd much rather have a sweeter ice cream. My wife and I ate this last night and she thought they accidentally put a vanilla gelato in our container. If you're looking for a real key lime pie flavor, don't expect it here. There is a very very faint fake lime flavor, but overall it just tastes like sweet vanilla. I wouldnt say tart or tangy, just a very mild residual bite to it. Like, I could tell I had citrus kind of thing. if i can be (blunt?) for a moment, to those who are disappointed by this one, I do get it, but please keep in mind that traditional key lime pie flavors don't really do well in the freezer aisle. By giving us something mild and sweet, there is the chance of gaining wider acceptance among the masses. We'll see how it plays out, please keep the comments coming! It's honestly the worst Talenti flavor I've had. I have taken a couple more bites hoping I'll find something good about it and it gets worse. Even ice cream I don't care for I'll eventually get to eating a few bites, but this one I want to chuck in the garbage. It's soooooo sweet and tastes like Sprite. True, the lime is mild and sweet - but I didn't find it overly fake. I thought the subtle, creamy taste worked for a key lime pie ice cream, and the graham swirl was a fabulous addition (I would love more of the swirl). I concur with Dubba on this one. When I have Key Lime pie, and what makes that dessert so delicious in moderation is the balance and texture of it. If you've ever had a good piece, not frozen, you'd know the trifecta of balance. Buttery, slightly savory graham and uniquely sweet Key limes that smack the left and right side on the underside of the back of your tongue with a tart, nearly acidic kick. You get half of that trifecta in this ice cream. It's creamy, bright and fresh. 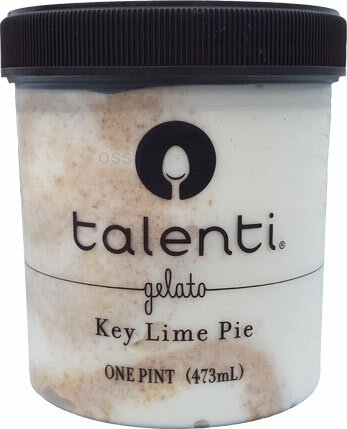 Talenti has got the unique key lime flavor in it's base. The graham is very pleasant albeit too few swirls and bits (that's Talenti) however. So once I took my first bite and passed through one and half let's say my flavor journey ended. Sweet from start to finish with minimal graham. This was a flavor I liken to The Lonely Islands "When will the beat drop"! I wanted to be smacked with tart, tangy, acid.....something. I got nothing. Really a let down. I don't mind a sweet all the way through Ice Cream at all but when a product claims to be something there becomes a level of what to expect. They failed on recreating Key Lime pie, which is what I gather Talenti was aiming for. What a bummer, they just needed some more ascorbic acid or something. This Sunday I will add a lime juice shot to the ice cream and see where that brings it. Overall, not terrible, just not Key Lime. Can't be Lime without being tart. Sorry. @Jeremy: do you have any go to brands that provide a more tart experience? we've definitely got a running theme here so I'm wondering where to point people. I can't think of any in main stream production. I think I've had turkey hill and B&J for Key lime. Was never impressed though. @Jeremy. 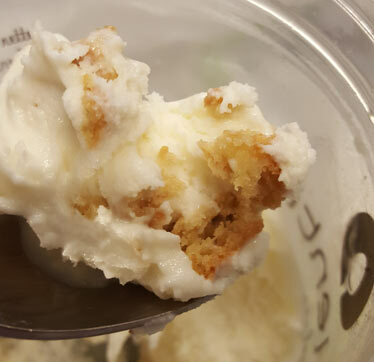 I improved the flavor of this gelato by mixing the juice of one lemon to my last serving. That's probably overwhelming for most people, so a few drops should satisfy most people. @Dubba. I have not found any lemon/lime flavor ice cream that's tart. Most people want their ice cream to be very sweet. I love this. However I wish it had more lime flavor. It is missing a tartness and I honestly taste "coconut". Reminds me of coconut cream pie. I, too, am disappointed in this flavor. The lime flavor tastes way too mild. Ciao Bella had/has a really good key lime flavor gelato and if you really want to know what key lime pie SHOULD taste like, pick up a slice of Edwards single slice key lime pie. I love every Talenti flavor I've experienced however this one is good but it is not key lime. It tastes like vanilla and graham crackers. I tried this flavor tonight, and I was so disappointed! It didn't taste like key limes, or even limes, at all. It seriously just tasted like a muted vanilla gelato with a slight tang and some cookie pieces that vaguely taste like cinammon. I thought it was odd, and it left a really weird "minty" feeling in my mouth after I tried it. 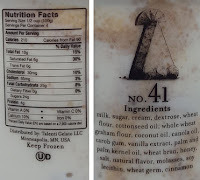 I also looked at the ingredients and there was palm oil in there along with a few other different types of oils, but noticeably absent from the ingredient list was any mention of the word "lime" which means it's all attributed to "natural flavors." Talenti really dropped the ball with this one. This one is a mild lime, and it's OK. I'll finish it, but may not go back for more. The best Key Lime Pie ice Cream out there is at Brusters. Solid lime flavor but what makes it the best is the Graham Cracker pieces. They have just a bit of a ginger bite that makes the whole thing work. Going to stick with that. It was supposed to be a monthly flavor, but it's stuck around longer in the Atlanta area, not sure about the rest of the country. I could barely taste any lime in this. VERY disappointed! There are some graham crumbs, but that's about it. By contrast, I think their Coffee Chocolate Chip is phenomenal. Agree with Dubba on it being more like a key lime cheesecake than a pie, though I would only go "good" rather than "excellent." It is quite pleasant but might be better in combination with another ice cream or "a la mode" with a piece of pie. The lime flavor has been rather mild the few times I've eaten key lime pie, so I wasn't expecting to (and was not) overwhelmed by that flavor (the smell when I first opened the container was stronger than what I actually tasted, but the smell wasn't even that powerful); did anyone who wanted a stronger lime flavor try something like squeezing juice from a lime or pouring some Sprite (I know it's lemon lime, but I don't know of any lime sodas) on it? Or maybe a contrasting flavor like cinnamon? Cracks me up that you say it's a "Mild" lime flavor. There IS NO LIME FLAVOR at all. look at the ingredients. 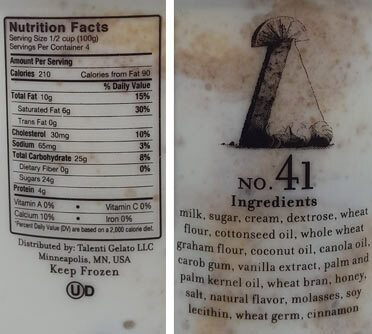 for everyone who says it tastes like vanilla, yup, amazing--cause that is the flavor listed on ingredients. It is misleading to call something Key Lime and have NO lime taste at all! like many products, it bundles the lime under "natural flavor", doesn't mean it's not there at all. Yes there is always the possibility that the flavor wavers a bit from batch to batch, but you just happen to fall on the side of people that don't notice it that much. We have plenty of flavors on the blog where the crowd gets distinctly split between those who notice a certain aspect and those who don't. not every flavor is meant for every person. I have lived in FL for the last 24 years and have, I believe, become adept at making a proper key lime pie. In each 9" pie I include 3/4C of freshly squeezed key limes, which imparts the desired degree of tartness. It is this tartness that distinguishes a KLP from, say, a lemon merengue or chiffon pie. This Talenti gelato falls far short of replicating an authentic key lime flavor. The best, and really the only key lime pie ice cream that succeeded in my opinion was the Publix store brand, which they sadly replaced with a frozen yogurt version about ten years ago. Still, it's head and shoulders above the Talenti gelato, which in my view suffers from irredeemable timidity and blandness. I tried this one, but was unimpressed. The ice cream flavor is so weak, it just tastes like vanilla, the lime flavor needs to be much stronger. There's not enough of the graham cracker crust mix-in is. This is basically just an overpriced pint of plain vanilla ice cream.